With outstanding performances, PC plastics are highly transparent, impact-/creep-resistant and can be applied within a wide range of temperature conditions. The technological characteristics of PC include: the viscosity of molten PC is not so sensitive to shear rate, but temperature; no clear melting point; the melt is highly viscous; the resin tends to decompose under high temperature conditions and the product tends to crack. So, PC needs to be differently treated based on these features: instead of increasing injection pressure, raising injection temperature is required to improve melt fluidity; mold runner and gate are required to be short and wide, so as to minimize melt pressure loss, while guaranteeing a high injection pressure. The resin needs to be thoroughly dried before the injection molding process, to keep its moisture content below 0.02%. In addition, the material should be kept warm, in a bid to prevent moisture absorption. Not only does the product need to be properly designed, also the right molding techniques need to be employed, e.g. raising mold temperature or applying product post-treatment which helps minimize or eliminate internal stress, and timely adjusting processing parameters depending on product conditions. Technological Characteristics of PC: PC requires a high injection molding temperature (270 – 320℃) due to its characteristics of high viscosity, high melt temperature and poor fluidity. Relatively speaking, the adjustable range of material temperature is narrower than that of PMMA. Though having little influence on fluidity, a high injection pressure is still required due to the high viscosity. And accordingly, to prevent the generation of internal stress, holding time needs to be minimized. 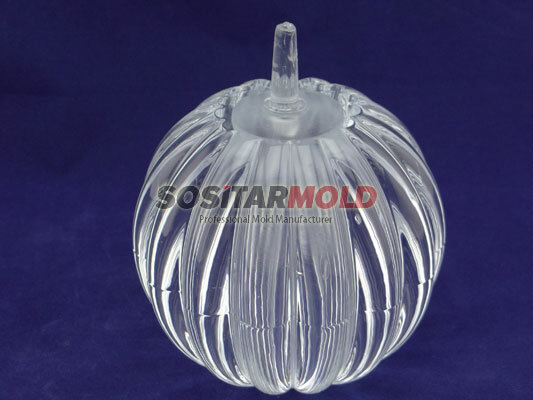 The characteristics like high shrinkage rate, dimensional stability, as well as high internal stress and easy cracking of the product make it reasonable to raise temperature instead of pressure so as to improve fluidity, and at the same time, raise mold temperature, optimize mold structure and apply post-treatment to minimize the possibility of cracking. When injecting at a low speed, ripples tend to occur around the gate, so the temperature of the injection nozzle needs to be controlled separately, while guaranteeing a high mold temperature, and low resistance in runner/gate. 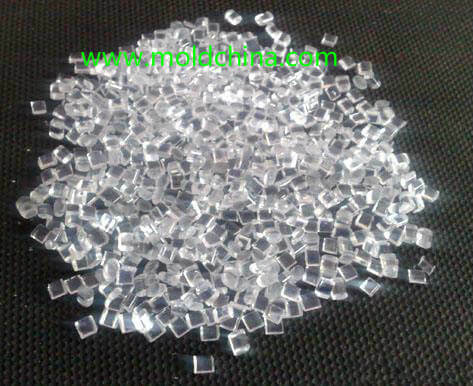 The Plastic Injection Molding Performance of PC: as a group of crystalline polymers, PC has a clear melting point – melting at 220℃ and decomposing at 350℃; its general processing temperature is between 250 and 320℃; it absorbs moisture, and a slight amount of moisture can cause it to decompose at a high temperature, so it needs to be dried at 120℃ for 4 – 5h before injection molding; the melt of the PC material is quite viscous, so a high injection pressure is needed; when processing the PC material, if conditions allow, mold temperature controller can be used to increase mold temperature, so as to reduce product internal stress; when an insert has to be involved, preheating will not be necessary for inserts with a diameter smaller than 1 – 2mm, but larger inserts need to be preheated, or else cracks will be caused by internal stress; the shrinkage rate of PC has nothing to do with processing conditions and product thickness; with similar vertical and horizontal shrinkage rates, PC can be used to manufacture high-precision products; its shrinkage rate is 5‰ and overflow limit value 0.05mm. Injection temperature of PC needs to be decided by compressively considering the various conditions like product shape, dimensions, performance, requirements, as well as mold structure, etc. Usually, molding temperature ranges between 270 and 320℃. If material temperature is too high, e.g. over 340℃, PC will decompose, leading to a darker product color and causing defects like silver lines, dark strips, black spots and bubbles, etc. At the same time, physical mechanical properties will decline dramatically. Injection pressure has certain influence on the mechanical properties, internal stress and shrinkage rate of PC products, but has a greater influence on product appearance and mold release performance. If the pressure is too low or too high, product defects will be likely to occur. Usually, the injection pressure is controlled between 80 and 120MPa. For products that feature thin walls, long runners, complex shapes and small gates, higher pressure (120 – 145MPa) will be applied to overcome resistance to flow and ensure sufficient filling, thus realizing a complete and smooth product surface. Holding pressure/time have a great influence on the internal stress of a PC product. If the holding pressure is too low, shrinkage compensation will be compromised, leading to vacuum bubbles or shrink marks on product surface; if the holding pressure is too high, great internal stress will be caused around the gate. In the actual production process, this problem is often solved through high material temperature and low holding pressure. Holding time should be selected based on product thickness, gate size and mold temperature, etc. Generally speaking, small-sized and thin-walled products don’t require a very long holding time; on the contrary, large and thick-walled products need a longer holding time. The length of holding time can be identified through testing on gate-seal time. Injection speed has no obvious influence on the performance of PC products. Usually, medium or slow injection speed is applied, except for products with thin walls, small gates, deep holes or long runners. Multi-stage injection is preferred, esp. the slow-fast-slow multi-stage injection process. Usually, it is OK to keep the mold temperature between 80 and 100℃. For complex-shaped, thin-walled and demanding products, the temperature may be raised to 100 – 120℃, but don’t exceed the heat deflection temperature of the mold. Since the melt of PC has a high viscosity, out of consideration for easy plasticization, venting and injection machine maintenance, the screw should be protected from overburdening, so screw speed cannot be so high – usually, the appropriate speed range is between 30 and 60r/min, while the appropriate back pressure is 10% – 15% of the injection pressure. The application of mold release agents should be strictly controlled during the injection molding process of PC. Meanwhile, the application of recycled materials cannot exceed 3 times, with the application quantity limited at around 20%. It is required that the maximum injection volume (including runner and gate, etc.) of the product does not exceed 70% – 80% of the nominal injection volume; single-thread and constant-pitch progressive compression screws with check rings should be selected, of which the length-to-diameter ratio (L/D) is 15 – 20, and the geometric compression ratio (C/R) is 2 – 3.